It really is as simple as this – food equals health, healing, security and well-being. For many older adults living alone, having a meal delivered can also provide personal contact and connection. As the population ages, more people live with chronic and life-threatening illness, and people are more distant from family and friends, the demand for home delivered meal programs grows. Even as the demand for these services increases, funding for them is shrinking. In coming years the organizations that provide this service will need to do more with less. So, as Senior Program Officer for Aging Therese Ellery approached her 2016 grants for these organizations, she and the Committee on Aging arrived at a new approach. They reviewed the organizations’ requests for ongoing funding, but they also invited them to apply for a one-time grant to fund innovation and/ or investment in their operation. They did this to help ensure that each of the nonprofit organizations is prepared to meet the challenge of the coming years. Ellery and her committee also reached out to partner with a family foundation – the Paige Family Foundation in Broomfield – to make the one-time grants even larger. Of the seven applicants for grants to support home-delivered meals, six of them applied for one-time funding. Longmont Meals on Wheels which is located in Longmont’s Senior Center delivered more than 100,000 meals in 2015, and is on track to deliver 110,000 in its service area of Longmont, Niwot and Hygiene. The organization also prepares meals for the town of Lyons, and sells them to an agency there well below cost. Longmont Meals on Wheels does not accept any federal or state funding, so that it can take food donations and serve an expanded population. “Our biggest need right now is continuing to respond to our growth,” says Karla Hale, executive director of Longmont Meals on Wheels. The organization used the one-time grant to streamline and update their current equipment so that their operation can continue to grow and serve more people. Hale is quick to point out that her organization provides much more than a meal. “All of our meal deliveries also provide wellness checks,” she says. The delivery drivers can contact emergency personnel if they cannot make contact with a client. “Many of the people we serve don’t have anyone,” she says. Project Angel Heart, which operates in Denver and Colorado Springs, also took advantage of the one-time grant to develop the infrastructure to launch a new program. The Meals for Care Transitions program is a partnership with healthcare providers to provide medically tailored meals delivered to patients who have recently returned home following a hospital stay. Having good nutrition significantly reduces rates of readmission to the hospital. “Clients also tell us that they are better able to keep up with their care regimens,” says Erin Pulling, president and CEO at Project Angel Heart. The grant allowed the organization – which serves 1,200 clients each week– to purchase a large cooler, meal racks, a sink and establish other infrastructure to support this particular program as well as overall capacity. The program serves clients like Joe, who is 60 and suffers from end stage renal disease, congestive heart failure, and several other debilitating conditions, all while he cares for his own mother. Although Joe’s doctors gave him strict dietary guidelines to help manage his health conditions, cooking was difficult due to his fatigue and difficulties standing and walking. He often just asked a family member to pick up fast food for him. As a result, his health was declining. 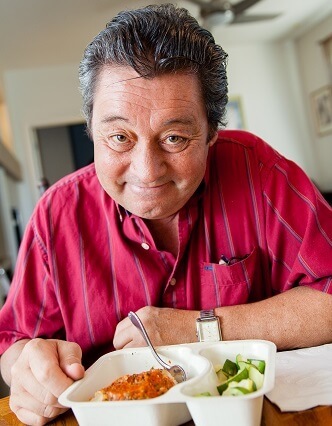 After being referred to Project Angel Heart by his dietician, Joe began receiving kidney-friendly meals low in acid, sodium, phosphorus, and potassium. “Recently, my blood test results came back normal, which is unheard of for me and I know it’s because of [Project Angel Heart’s] food,” said Joe.